I’m not certain what made me decide to pick up this issue of SHAZAM, though I’d imagine that it has something to do with the return of another Golden Age hero, Fawcett’s Minute Man, in the story. I’m pretty sure I got it while on a visit to my grandparents, so that may have played a role as well–my selection may have been limited. It’s a fun issue, created during the point where DC was trying to align the comic book more with the SHAZAM television program then airing on CBS Saturday Mornings. Consequently, Billy Batson was on detached assignment from WHIZ Television, roaming the country and reporting initially on the bicentennial celebration, and then other similar events after 1976 wound down. Along for the ride was Uncle Dudley, who had grown a mustache so that he would more readily resemble Les Tremayne, who played Mentor on the television program. 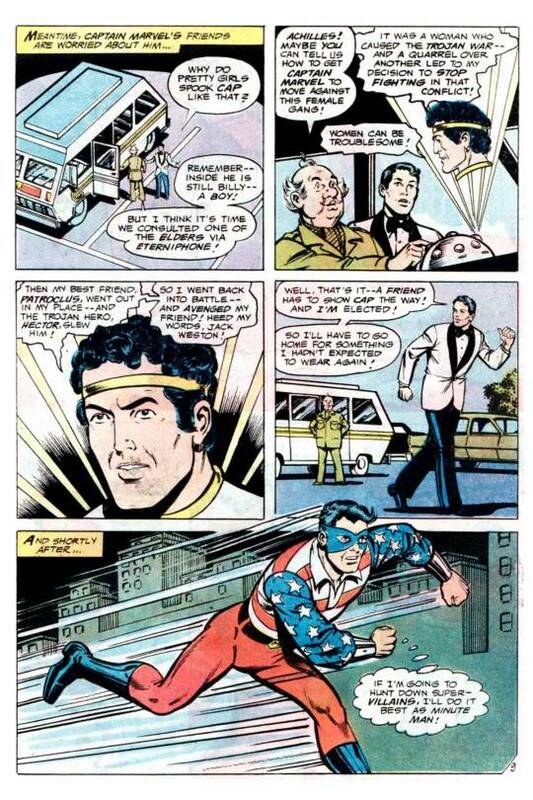 They used a Winnebago as a mobile television studio, similar to the series, and carried with them a device that allowed them to ask the sage council of the six gods and heroes whose initials empowered Billy when he said Shazam. Writer E. Nelson Bridwell, who was a major fan of Cap’s 1940s adventures, too his cues from a series of stories in which Billy and Captain Marvel visited real cities around the nation, and interacted with the local sales reps for those areas–a bit of glad-handing that helped to insure prominent placement for Fawcett’s titles. 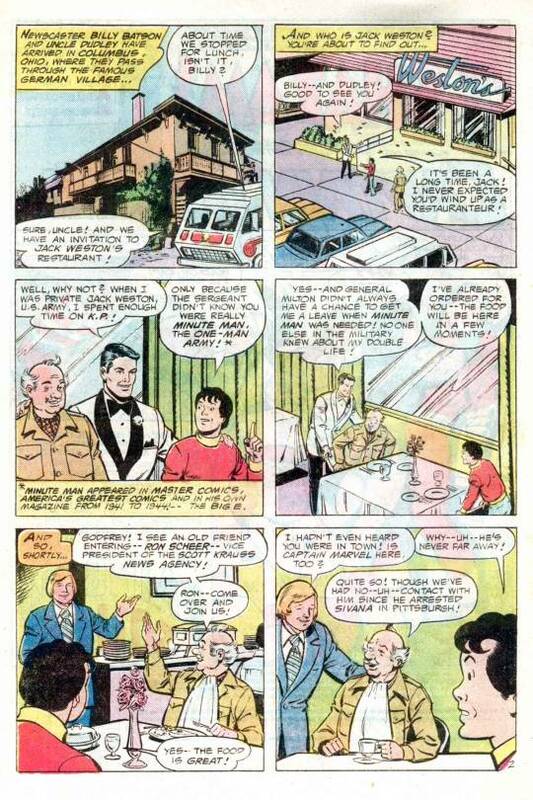 As this issue opens up, Billy and Uncle Dudely are in Columbus, Ohio, where they dine at the restaurant owned by Jack Weston, formerly the star-spangled hero called Minute Man. As they chat with Weston, the restaurant is robbed by a sextet of costumed women, each one wielding powers related to one of the six gods and heroes whose initials form Shazam. 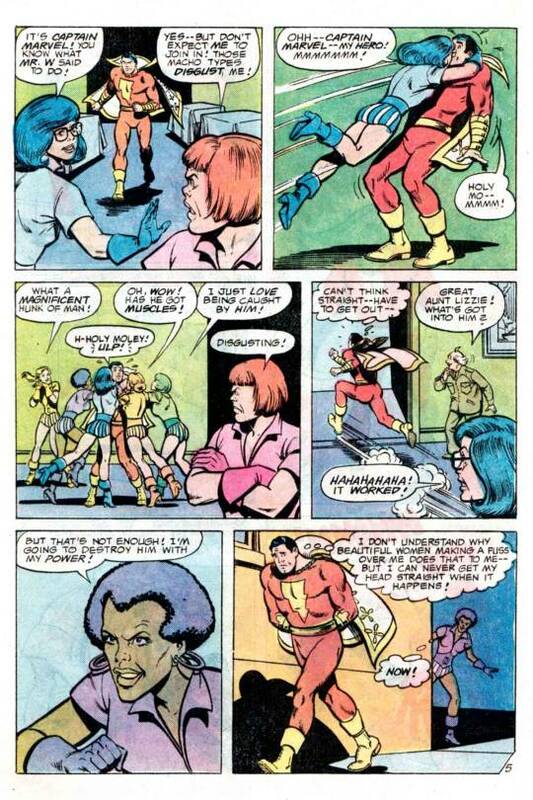 Billy summons Captain Marvel, but the big lug’s chivalry won’t let him hit a women, and so the criminal gang smothers him with kisses, driving him off. 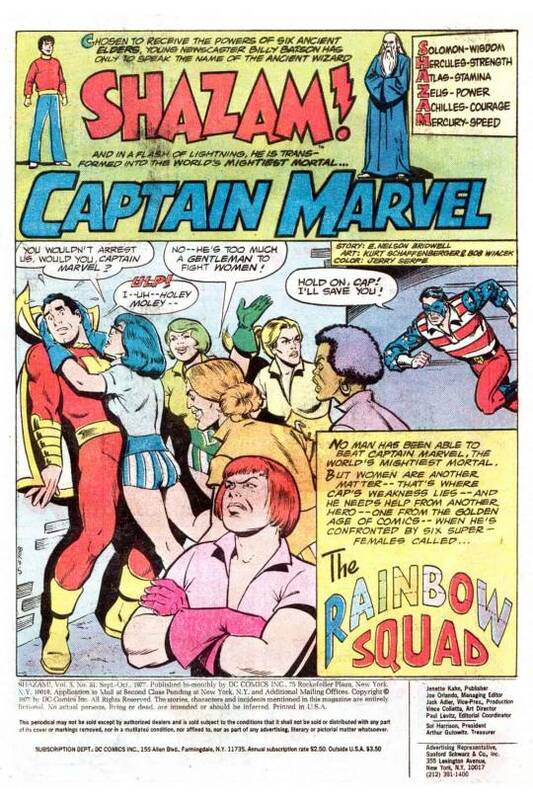 It’s a sad moment for Captain Marvel–and one that felt a little bit out-of-step even when I first read it in 1977. Surely Cap didn’t need to punch these women in order to detain and defeat them. The six women report back to their patron, Mr. Wonderful, who reveals how he empowered them and who cackles in a sinister and distinctive laugh. But he’s upset that Dynamoll used radiation against Captain Marvel rather than lightning as he’d ordered. Meanwhile, seeking a solution to Marvel’s difficulty, Dudley and Weston consult with Achilles, who tells them a tale of the Trojan War, and how he was helped out of a jam by his friend Patroclus. Weston takes this as a cue to get back into costume, and it isn’t long before Minute Man is on the streets again. And it’s a good thing, too, because Dynamoll has located Captain Marvel, and zaps him with lightning that transforms him back into Billy. 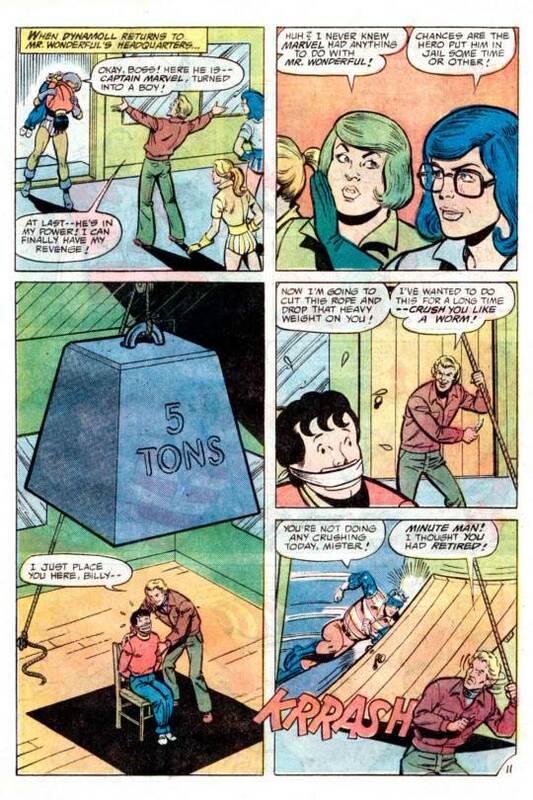 She’s able to bind and gag him before he can say Shazam, and so Billy is helplessly brought back to Mr. Wonderful’s headquarters. The cackling villain places Billy underneath what must be the lightest 5 ton weight in existence, given that it’s held aloft by only a single strand of rope, and prepares to drop it on Billy’s head. 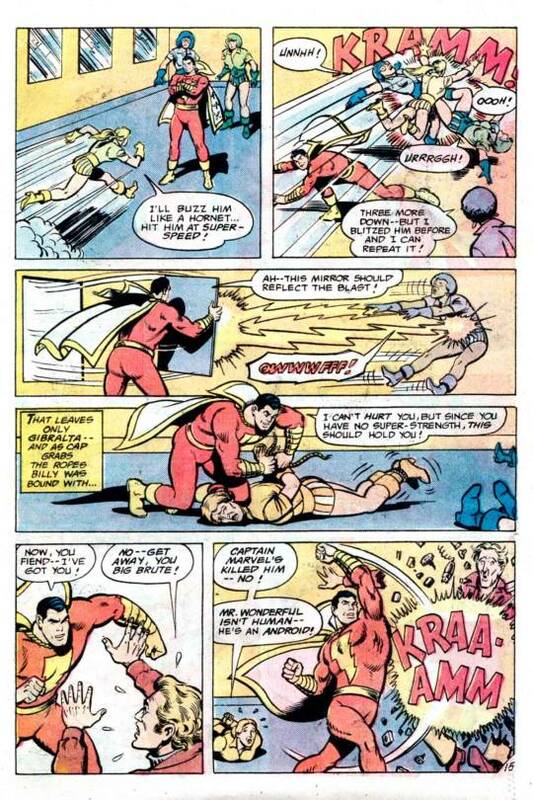 Just then, Minute Man appears, pulling the gag off Billy’s mouth just in time for him to say Shazam and for the weight to shatter across Captain marvel’s indestructible body. But Marvel still won’t hit a woman, so he’s in trouble–until Minute Man wades into the fray, getting knocked around like crazy. This prompts Marvel to use passive resistance to overcome his female foes, and he calmly dispatches them all one-by-one without needing to strike them. You could have done that at the start, you know, Cap! Wisdom of Solomon indeed! Anyway, Captain Marvel DOES slug Mr Wonderful, who flies apart in a shower of sparks–he was a robot. 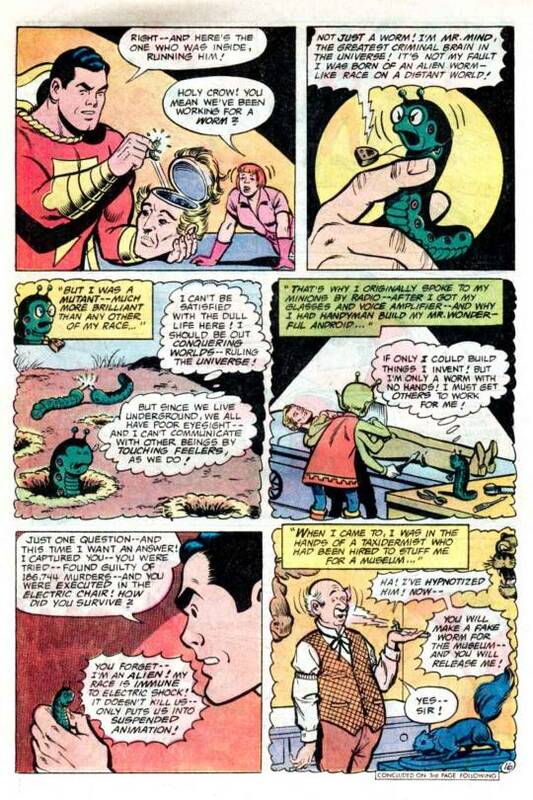 And not just any robot, but one being piloted by Captain Marvel’s old enemy Mister Mind, the malevolent worm. Here’ Bridwell takes a moment to clear up a bit of continuity that must have been bothering him since the SHAZAM series launched in 1973: wasn’t Mr. Mind electrocuted at the end of the Monster Society of Evil serial that ran through WHIZ COMICS in the 1940s? Turns out that he was able to control the executioner and replace his body with that of a double. While Marvel is gaping at this new knowledge, Mind slips away–but not before indicating that he has business to attend to in Detroit next. That’s going to be Billy and Marvel’s new destination as well, and so marvel bids goodbye to Minute Man, who is considering coming out of retirement and remaining active as a super hero. But this never happened–this was the final appearance of Minute Man in a DC book for decades.